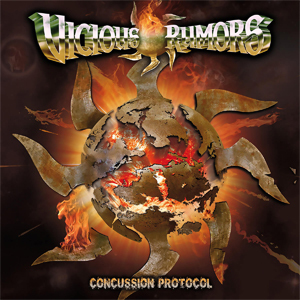 VICIOUS RUMORS' Concussion Protocol proves yet again ... as pioneers of power metal, they remain driven to consistently innovate and forge new paths into ever-expanding musical territory. Known worldwide for their high-energy shows and top quality musicianship ... VICIOUS RUMORS is perhaps the most versatile band of the heavy metal genre. Their debut releases on Shrapnel Records, Soldiers Of The Night (which was also the full length recording debut of metal guitarist extraordinaire Vinnie Moore) and Digital Dictator - are unanimously considered to be full-on metal classics, by both fans and reviewers worldwide. VICIOUS RUMORS' three subsequent releases on Atlantic Records (and the companion MTV videos, which landed in regular rotation on Headbanger's Ball) served to cement their reputations in heavy metal music history. Countless tours, eleven studio and three live albums later - it is now well beyond question that the band will never fail to deliver a relentless, driving energy and commitment to excellence. Their major festival appearances at events like Bang Your Head, Rock Hard and Wacken Open Air over the years have left no doubt - this is a band who is not satisfied to simply rest on their laurels. The stage is now set, and Aug 26th 2016 is the date to mark on your calendar - the worldwide unveiling of what will no doubt be remembered as a milestone release for both the band and the genre, Concussion Protocol. Not simply a "return to form", the production team of Juan Uteaga (TESTAMENT) and band leader Geoff Thorpe has been solidifying their working relationship for the past ten years, and has deftly zeroed in on the new strengths of a fully re-vitalized band - that now features newcomer Nick Holleman on vocals, Tilen Hudrap on bass and Thaen Rasmussen on guitar ... alongside veteran guitarist Geoff Thorpe and drummer Larry Howe ... as well as guest appearances by some long time VICIOUS RUMORS friends: guitarists Steve Smyth and Brad Gillis. Consider yourself forewarned - Concussion Protocol will simultaneously explode out of the gate with the passion & fire of a newly galvanized band - and the maturity in writing and performances that can only come from the most seasoned metal outfits. The songs run the gamut: the melodic power of "Take It Or Leave It", the brutality of "1000 Years", and the haunting "Circle Of Secrets" will take you on a sonic roller coaster ride of pure, unadulterated, cutting-edge metal adventure - and will demonstrate yet again - VICIOUS RUMORS will place no limits on their creative inspirations. Of course, true to form - there`s the shredding guitar solos, melodic and powerful vocals, double bass drum thunder, bass guitar madness, and the thought provoking songs that are all part of the historical band sound - yet somehow, amazingly -VICIOUS RUMORS still expertly traverses both known and yet unknown metal territory. Concussion Protocol will be released through SPV/Steamhammer on August 26th, 2016 as a digipak version (incl.poster), 2LP gatefold red vinyl edition and download. "Victims Of A Digital World"
"Every Blessing Is A Curse"